The days for waiting for the dance floor to warm up are well gone, stating that receptions have been taken to a new level would be an understatement! The old fashioned newly hip camera in a booth. If a Bride and groom want an insight into their guests real personalities this trendy photo invention is the answer. Not only does it entertain your guests and give them an instant four photo keepsake , it truly brings out the child in everyone. Around 6pm guests tranquilly begin to arrive to the reception, few spot the photo booth and question what in the world is that doing at the edge of the dance floor? The girls say: We didn’t know there were all these fun props, can we go again? Sombreros, cowboy hats, masks, giant glasses, moustaches and lips on sticks. Which costume will be the funniest and most flattering at the same time? Eventually the girls relay to everyone that the booth will indeed take your pictures automatically and it just so happens to be the best thing ever! Grandma and Grandpa wait in line confused by the fiasco of their family wrapping hot pink boas around their necks and coercing them to make silly faces, All dolled up in crazed attire they make their way inside the curtain,they pose nicely in front of the screen that reads touch to start,it doesn’t take long before they are going crazy enjoying themselves and rolling back the years. The children dressed in their crazy glasses and hats are awestruck by it and remain glued to it all evening. The kids parents are delighted with their freedom to mingle at the bar. A group of five groomsmen come running over, beer in hand. They joyfully fill out the guest book with pride next to their funny photographs. Scribbling how delicious he beer was and how their buddies new wife will never compare to their bromance! The young girls come again with their eighteen photographs in hand, let’s make it nineteen! As the night continues and the guests empty their drinks the more creative the photo booth poses become. Even the most reserved adult guests enter the booth and immediately feel liberated by the enclosed curtain. It’s just them alone with the camera able to act however they desire . The Bride and groom make an entrance into the photo booth and they kiss for the first photo , make silly faces for the second and pose sweetly for the third- the fourth the brides little brothers without invitation whiz open the curtain and stick their heads in the back of the their photo – everyone laughs hysterically! By the last song of the night the guest book for the bride and groom is full of photos and signed notes and scribbles of love and luck.All the pandemonium that occurred inside that little photo booth diffused for the night. Only to be discovered again by the evidence captured and pasted into that little guestbook , what a laugh that will give everyone for years to come. Luxury photo booth hire Chesterfield Derbyshire Sheffield fits up to eight people and is one of the largest in the Chesterfield Derbyshire Sheffield area. Any couple thinking of having their wedding at Ringwood hall hotel Derbyshire- the photo booth is included in their winter package! A busy wedding show yesterday at Ringwood Hall Hotel Chesterfield, a mid week show didn’t put people off making the effort to come along after work. Lots of couples enjoyed our stand looking through our wedding albums and trying our photo booth, nice to see couples who had already booked with us. The hotel looked fabulous throughout. Here are a few pics of some of the suites set up for ideas and inspiration on how your wedding could look! Ringwood Suite, Coach House Suite, Portland Suite and Chatsworth. A great show yesterday at the Palace Hotel Buxton set in the heart of the stunning Peak District in Derbyshire. Our luxury photo booth was in full swing, lots of people enjoyed trying our props and had loads of laughs. Many Bride and grooms hadn’t experienced a photo booth before and said what a great idea and fun addition for their wedding evening reception. Here are some pics from the day , showing the Palace Hotel, their reception and stunning staircase and the High Peak Suite where we were exhibiting our photo booth. Our exiting new luxury photo booth props just arrived!! Great for weddings, parties, proms- anything! Come and join the fun in style, our luxury booth fits up to 8 people! We cover Chesterfield, Derbyshire, Sheffield, and Nottingham areas. Congratulations to Jon and Leah who celebrated their fabulous wedding at Ringwood Hall Hotel in Chesterfield on New years eve! An exciting day and evening to get married and have a party on- and they certainly did party! They have many wonderful wedding photographs for them to look back and remember – also not forgetting the funny photo booth images they have. 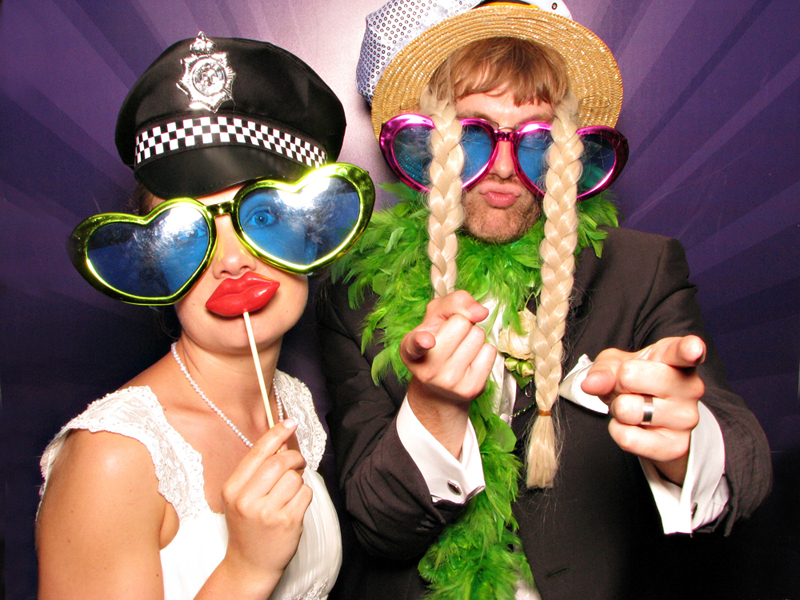 They had a great night in our photo booth, their guests were queuing all night and couldn’t wait to get in it! They topped it all off with a fantastic firework display at midnight.